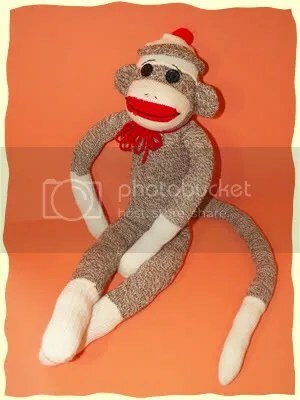 Has anyone else noticed a sock monkey revival? They’re all around me. I got a baby shower e-vite today that had a sock monkey on it. He was waving, and he really wanted people to know “IT’S A BOY!”. I see sock monkeys in stores now. They cost about 15 dollars, and I’m pretty sure they’re not made out of socks. They even have sock monkey Jack-in-the-Boxes. Yes, I bought one. Nothing says “Welcome to the World” like a little brown and white monkey that jumps out of a box! Perfect for a small impressionable infant. I have sock monkey pajamas. A friend gave them to me when I was in the hospital holding my first baby. She knew I’m not the prepared type and if it hadn’t been for her, I would have been stuck in a hospital gown. She also gave me travel sized mouthwash, toothpaste, and shampoo…I don’t know what that was about, obviously I can pack my own mouthwash! (Okay, so I didn’t pack mouthwash. This is why I make friends with people who give travel sized hygiene products as baby gifts). I felt a weird walking around the hospital with a bunch of festive, red hatted, monkeys on my back. Never mind that I was ALSO wearing slippers that smiled up at me in a nice, brown and white monkey way. Basically, I could have passed for an actual sock monkey if someone had handed me a banana. I miss the old sock monkeys. The ones that were made out of actual socks, and maybe they had a few grass stains under their armpit. They were rare, and I never actually owned one. Now, I could just buy one at the store, but…wouldn’t it be so much more fun to make one? I’m in the process of making a baby blanket. It will be my second attempt, I had made a blanket before but I didn’t have any pins. My Grandma kept saying “Babies don’t care how it looks, they just want something soft”. But I cared. A little piece of me died each time the fabric would bunch. Anyway, once I can manage a little blanket, I think I will move on to sock monkey. Maybe someday, I can make some sock monkey pajamas, and give them to a dear, dear friend who happens to be pregnant. I post these instructions because maybe someone will decide to make a sock monkey and send it to me. By the time I get around to making one myself, I will probably be really, really old. What can I say? I’m an achiever. On an unrelated/related note, Click here to see a Mr. T sock monkey. I KNOW! AWESOME! I've noticed the sock monkey revival too! Your hospital outfit sounds adorable. I have a real sock monkey that's over 30 years old… My brother loved it for a while too thanks to the “No more monkeys jumping on the bed” song. Now my kids are playing with it, but it's actually developing holes all over because the socks are deteriorating! So sad… Perhaps one day I'll sew one too. lol.